Crab apple trees (Malus) are a popular landscaping tree in both home and commercial sites. They grow quickly and tolerate urban stress, pollution and salt, according to the St. Louis Forestry Division. Most crab apples are hardy to USDA plant hardiness zones 3 or 4. They produce prolific white to light-pink blossoms in mid-spring. Some varieties produce edible fruit in late summer to early fall. Crab apple trees grown under typical urban conditions typically live for 30 to 50 years, according to the St. Louis Forestry Division. In protected rural areas, they may live slightly longer, while in dense urban conditions, their life expectancy may be shorter. Factors such as disease, care, pruning and winter protection may affect their longevity. 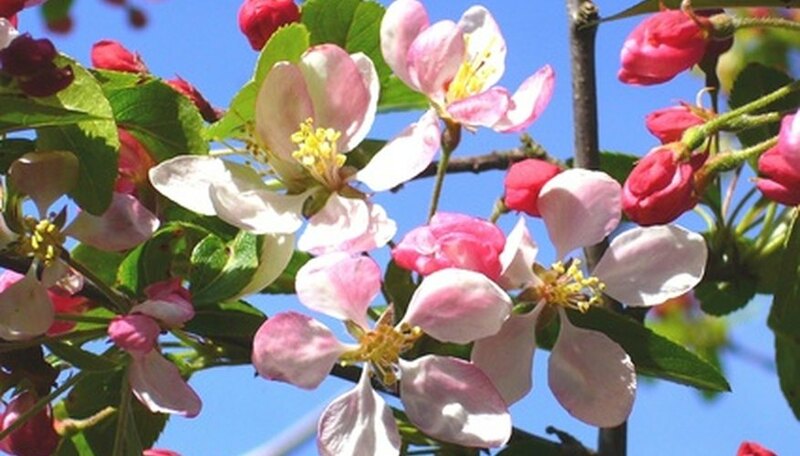 One of the main threats to crab apples is fire blight, a bacterial disease with no cure. The symptoms include curled browned or blackened leaves, oozing cankers and blackened limbs. In severe cases, fire blight causes death. The best defense against fire blight is to plant disease-resistant trees, such as Thundercloud and Indian Summer. Prune infected trees in late winter while the tree is dormant to remove infected areas. Pruning in the summer is recommended only if trees are heavily damaged. Disinfect pruning tools by dipping them in a solution of nine parts water to one part chlorine bleach between cuts to avoid spreading the disease. Apple scab is a fungus that causes soot-like spots on the leaves of crab apples, but it does not kill the tree. Planting a crab apple tree where conditions are optimal will increase its longevity. Crab apples need full sun and well-drained soil. They don't tolerate soggy, water-logged earth. Crab apples need minimal pruning to maintain health and control size. They are pruned in early spring or after flowering to remove dead, diseased or crossing branches. A few small branches (less than 1 inch in diameter) are removed from the tree's interior by cutting them back to the nearest crotch. This process allows more light into the canopy of the tree. Remove suckers growing at the base of the tree each year by cutting them closely to the ground. Although crab apples are tolerant of cold conditions, a 2-inch layer of mulch applied at the base of the tree will protect their roots from soil heaving, which occurs when the soil endures frequent thaws and freezes, causing it to push plants out of the ground. Crab apples planted near a building or other trees will suffer less winter damage than those in an exposed area. Additionally, proper pruning to remove dead and diseased branches minimizes loss of branches during the winter. What Is the Life Span of Stella Cherry Trees?